“As long as they do their job, I have no problem with having to listen to music that I’m not familiar with and routines that are a little bit different,” said Kelly, whose musical tastes stop and end with Bruce Springsteen more than Jay-Z, Beyonce, Drake and Travis Scott. 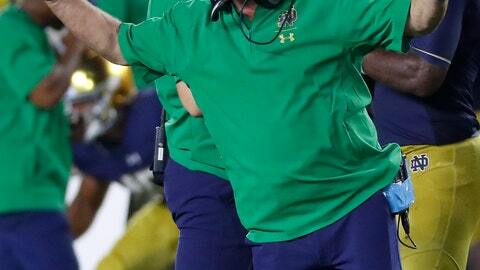 But there is a lot of football left and the rest of Notre Dame’s schedule is no cakewalk. After this Saturday, Kelly hopes the 2012 and 2018 teams will have something else in common — a victory over long-time nemesis Pittsburgh. The last time the rivals met in Notre Dame Stadium was in that 2012 season. The Irish survived a possible game-winning, 33-yard field goal by Pitt at the end of the second overtime to win 29-26 on quarterback Everett Golson’s 1-yard sneak. First-year defensive coordinator Clark Lea’s unit is led by senior linebackers Te’von Coney and Drue Tranquill, senior defensive tackle Jerry Tillery and junior cornerback Julian Love. The special teams have been solid with accurate senior placekicker Justin Yoon, now the school’s all-time leading scorer, and senior punter Tyler Newsome averaging 46.3 yards per kick. “I don’t know if I’m looking forward to playing the No. 5 team in the country because they’re awful good,” Pitt coach Pat Narduzzi said after his Panthers evened their record at 3-3 with a 44-37 overtime victory over Syracuse. Narduzzi’s teams have beaten two ranked teams in recent seasons — 43-42 at No. 3 Clemson in 2016 and then knocking off No. 2 Miami 24-14 in Pittsburgh to close out last season at 5-7. Following Saturday’s game, the Irish have an off week with five games against teams with a combined 14-13 record, four of them on the road: Oct. 26 at San Diego against Navy (2-3), Nov. 3 at Northwestern (2-3), Nov. 10 at home against Florida State (3-3), Nov. 17 against Syracuse (4-2) in Yankee Stadium and Nov. 24 at USC (3-2).